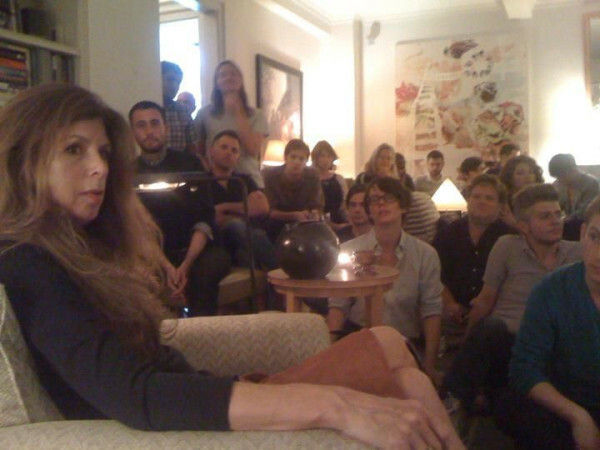 This week Wilde Boys hosted their first woman poet, Marie Howe, at this intimate salon for queer poets and writers. Crowded into the stylish living room, I ended up sitting on the carpet, nearly at Marie’s feet. The entire evening was breath-taking: a rare venue for creative conversation. She was both electric and generous. At one point, Marie asked the room of mostly young poets: what are your taboos? What is taboo? Sincerity, someone said. Being positive, said another (the one who spoke it meant HIV positive; Marie and many others leaped on the idea that the positive within itself is a current taboo). “My students,” Marie said, “in my writing classes, they all talk about how they’re afraid to be sentimental.” Would it be too much to appear sentimental? She asked: What if we wrote visionary poems that imagined a better world? What if every poet in this room wrote a poem of joy, joy without shame? I’ve been carrying these words around ever since. I’m no stranger to writing the heartbreak, the divorce, the mistakes, the judgement–but what if? What would happen in a world that reflected joy without shame?